This web page contains statistics on the life expectancies of the sexes in various countries in the world. The statistics shown on this page are a bit dated, from the year 2009, as per the World Health Organization. You may wish to check the source for more recent data. You can perform that little exercise by yourself and will find that the gender-gap in the life-expectancies of the sexes has widened a little more since that time. 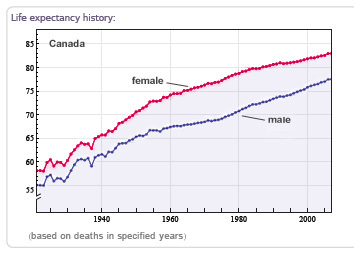 Certainly, life expectancies since then increased for both men and women, but on average more so for women. So what is the problem with that? There is not much of a problem, at least not one that men complain about. After all, who can argue with the truth? The truth will set us free, as the saying goes, but when the truth is inconvenient, it could become a problem, such as when the shorter average life-expectancies of men in the majority of the nations in the world must be presented in such a way as to show that men's earlier deaths are a serious inconvenience to women's quality of life when women reach the end of their days. With the exception of only six countries in the world, in all countries (see Table A) women can expect to live longer than men do, in some countries by a considerable margin (by as much as 14 years). Contrary to popular opinion, Afghanistan is not the country in which women are worst off as far as their average life expectancy goes there; Chad and the Central African Republic share that reputation. In those latter two countries women can expect to live on average for 48 years, while Afghani women can expect to live on average for 50 years -- three more years than Afghani men can expect to live (see Table E). Japanese women can expect to live the longest, for 86 years (six more years than Japanese men can expect to live), while the second place in the ranking of countries for women's life expectancy is shared by Monaco, Spain, France, Andorra and San Marino with 85 years (see Table D). Just as the statistics for the year 2000 showed, the group of countries in which women enjoy the largest advantage over the life expectancy of men is still being dominated by countries of the former USSR. Women's advantage over men in life expectancy ranges there from 12 years down to 10 years (see Table C). It can therefore be argued that totalitarian socialism has been very good for women of the countries in the former USSR, but that is an illusion. Take for example the Russian Federation. The average life expectancy for Russian women at birth is only 74 years (100th place out of 193 countries) and for Russian men it is far less than that, 62 years (137th place out of 193 countries). The harsh reality of socialist bliss for Russian women is that they did not get much of it, far less than women in many other countries did, and that their illusory gains came at a terrible price to Russian men. Life expectancy is not the only measure of quality of life. The UN has since 1990 annually published a Human Development Index that ranks countries by quality of life based on a combination of indicators, such as life expectancy, availability of schooling (but not the quality of schooling), the GDP per capita, availability of health care (but not the quality of health care) and more. The UN Human Development Index has shortcomings that have been addressed by the Fraser Institute in a more realistic alternative to the UN Human Development Index. An additional indicator that should be used by the UN as well as by the Fraser Institute to measure the quality of life in a given nation is a measure of how satisfied people in a nation are with their quality of life. Suicide rates are a very good indicator that can be be used for that. It surely can be no accident that the ranking of nations according to life-expectancies very closely matches that according to suicide rates. By both of these measures, life expectancies as well as suicide rates, men's lives are almost exclusively in all nations far worse than those of women's. Just about all of the men in the world could use a good portion of the gender equity that made women so "much more equal" than men.